Danish author; born in Gandersheim, Brunswick, Jan. 3, 1780; died in Copenhagen July 28, 1854. From 1802 to 1805 he lived in the latter city as a private teacher, being subsequently appointed tutor in the family of Count Schimmelmann. In 1810 he became a naturalized citizen of Denmark, and entered the service of the government as chief of the bureau of the national debt. He resigned his appointment in 1821, receiving the title of professor. 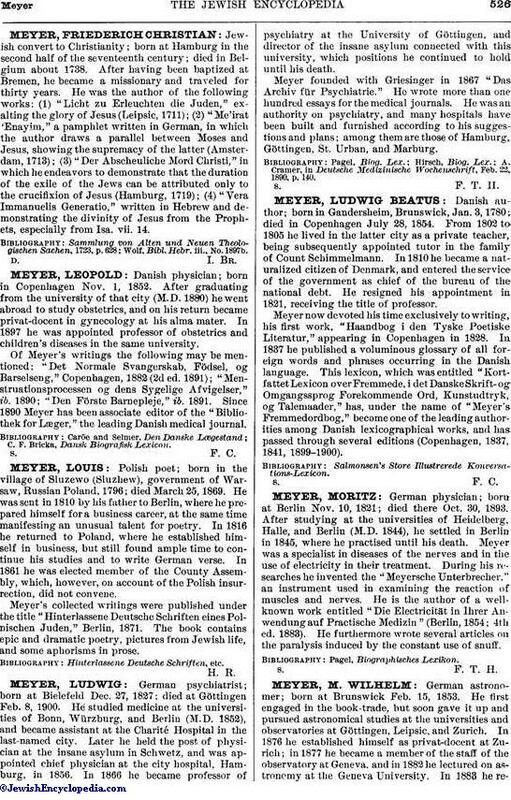 Meyer now devoted his time exclusively to writing, his first work, "Haandbog i den Tyske Poetiske Literatur," appearing in Copenhagen in 1828. In 1837 he published a voluminous glossary of all foreign words and phrases occurring in the Danish language. This lexicon, which was entitled "Kortfattet Lexicon over Fremmede, i det Danske Skrift-og Omgangssprog Forekommende Ord, Kunstudtryk, og Talemaader," has, under the name of "Meyer's Fremmedordbog," become one of the leading authorities among Danish lexicographical works, and has passed through several editions (Copenhagen, 1837, 1841, 1899-1900).